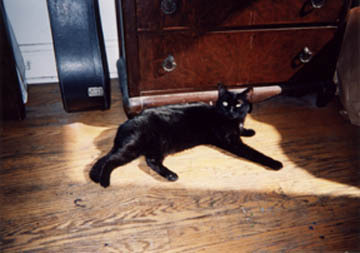 Dragon Lady was an eight-week old kitten when she was brought to me in a cardboard box, in October of 1989, delivered by a co-worker whose boyfriend worked at a firehouse where they sometimes got abandoned cats. It took at least two years for us to figure each other out; but once we cracked each other's code we were pretty much simpatico. Dragon Lady was passionate, complicated, high-strung, talkative, sometimes crabby and sometimes very affectionate, and sometimes both at once. She could purr and hiss at the same time. She wasn't conflicted; she was multi-leveled. She earned her name through her constant kvetching as a kitten, combined with her impressive displays of feral picque at the vet. The good-natured and highly competent staff at the Blum Animal Hospital never failed to chuckle over her name, but she made them respect her when she went bobcat on their asses in the exam room. 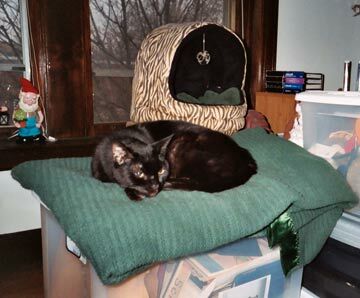 Yet for all her temperament, she was amazingly vulnerable and dependent on me, almost more like a dog than a cat. She liked to follow me around and keep me in sight even when she wasn't in a mood to be touched. Her insecurities extended to her food as well, although I always made sure she had more than she could eat. She was the only cat I've ever heard of who kept a savings account. No matter how much or how little food was in her bowl, she'd never finish the last of it  she always made sure to leave a "savings deposit" in there for later. Early on I tried measuring how much she ate for a few days and then giving her only that much; she promptly cut back on her eating to make sure she continued to leave about half of the food in her bowl. So I stopped trying to get her to join the Clean Plate Club, because it was clear she'd rather go hungry than see the bottom of her bowl. She was the most communicative animal I've ever known. She could express more with a glance than most people I know can convey in two hours of talking. I know, I know, lots of people say that kind of thing about their pets. But there are degrees of it, and as animal eloquence goes, she was as close to Dorothy Parker as cats get. Nicknames: Sugar Biscuit (usually reserved for when she was at her crabbiest), Little Bright Eyes, The Pussins, Precious Little Pumpkin, Love Bunny, Little Mow Mow, Miss Dragon Lady. Favorite food: Sour cream (it was like smack to her). Favorite activity: Basking in a patch of sunlight. Favorite activity runners-up: Bathtub jumping, cave lurking, bug stalking. In her old age, I loved the crusty, pensive old librarian she had become; and yet the tiny kitten who had clung to my chest was still there as well. At the end she was weak as a kitten again, limp as a rag doll when I picked her up. 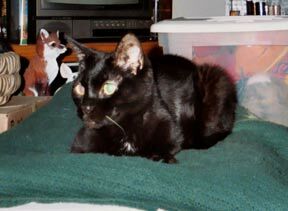 She was phenomenally healthy for 14 years; until March of 2004 her only sign of age was a single white whisker. Then suddenly one of her eyes didn't match the other and from there it was blood tests, specialists in the suburbs, steroid pills, eye drops, antibiotics just in case, and none of it helped, and then we found out she'd lost a pound and a half in two months and it pretty much had to be cancer. For two weeks before she died I was feeding her baby food out of little jars because she couldn't handle the solid food anymore. Her backbone felt sharp enough to cut my hand. Dr. Amir Shanan from Compassionate Vet Care performed an in-home euthanasia, sparing Dragon Lady the trauma of the vet's office. 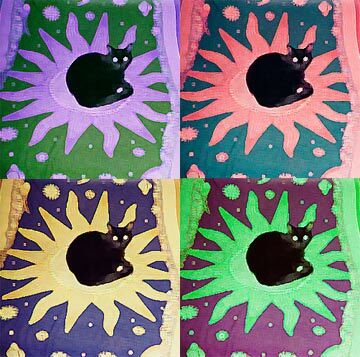 She died peacefully in my bedroom, on the green blanket. Dr. Shanan was kind and respectful and I highly recommend him if you should need his services at some point in the future. There is nothing quite like the bond you form when you live alone with a cat for nearly fifteen years, from your early twenties to your late thirties, sharing that animal solitude and camaraderie without any other roommates, pets or significant others around to dilute the bond. It was always me and Dragon Lady against the world; now it's just me. I'm confident that I will never have another friend like her.  Talking Heads, "This Must Be The Place"
memorial contributions can be made to The Humane Society of the United States.